Stefan Jacoby, GM Executive Vice President and President of GM International. At each of GM’s five regional celebrations (in Kansas, USA; Ruesselsheim, Germany; Sao Paulo, Brazil; Shanghai, China, and Rayong, Thailand), the company emphasized the important role customers have played in its accomplishment, and expressed its appreciation by giving new GM-branded vehicles to select loyal customers. “This celebration isn’t about GM’s manufacturing prowess. 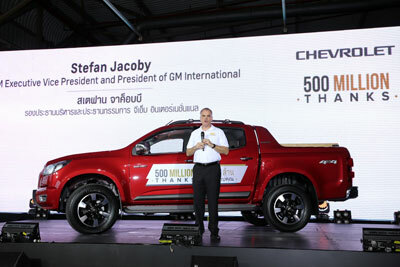 It is really about our customers and the positive experiences they’ve had with Chevrolet and other GM-branded vehicles around the world,” said Stefan Jacoby, GM Executive Vice President and President of GM International, at the Rayong event. At the U.S. event, GM CEO Mary Barra spoke of how the company’s vehicles have played vital roles in the lives of its customers – from daily commutes to family vacations, and in milestones such as weddings and graduations – and how GM looks to build on the achievement.